This past Tuesday, I had the opportunity to attend an event at Ciro's Speakeasy & Supper Club to sample the new Captain Morgan Black Spiced Rum! As soon as I confirmed my place, I knew I had to get one of my most fun friends Nichole to go with me (see her recap here). In true speakeasy style, we had to ring a doorbell and wait for someone to slide open a panel in the door for a password. Fortunately, there was no password required since we were there for an event, or maybe the "Captain Morgan" that came out of my mouth was the password and we got lucky, but nonetheless, it felt pretty cool and immediately made me love this place. For those wanting to visit Ciro's any other night, make sure to obtain the password before adventuring there! The decor and atmosphere make Ciro's feel very cozy and mysterious. It seems relatively small (or maybe that was just an illusion), with about 6 high tops situated by the bar, and then a number of booths down a hallway. The booths were closed in on 3 sides and had a curtain you could close on the 4th side for complete privacy. Within the booth, you can select your own music for your group and there is a button to press to summon your waiter if you'd like more delicious food and cocktails. Our event group met in the bar area and we were greeted with a punch cocktail called Captain's Punch created by Toby Maloney of Alchemy Consulting, a nationally renowned mixologist and expert in his field, who is versed in the history of spirits and entertained us with great stories all night. 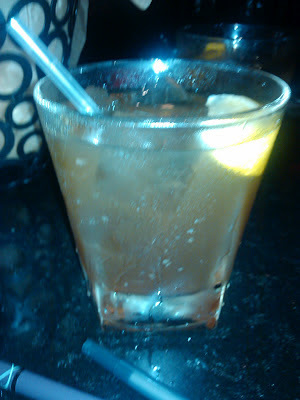 It was a fantastic punch that reminded me a little of a Rum Runner minus the overwhelming sweetness. With dim overhead lights and a single candle on each table, the ambiance is on point with the theme of the restaurant (Prohibition Era). On our tables, we all had menus and received Captain Morgan Black Spiced Rum booklets with recipes, history information and legend stories. Captain Morgan's Black Spiced Rum invites consumers to Step Into the Black (this was the name of the event) with its bold flavors and even tone. The Black Spiced Rum is crafted from Caribbean Blackstrap rum and select ingredients, including rich clove spice and premium cassia bark, and the liquid is finished with double charred blackened oak for a premium, smooth taste. The bold liquid definitely carries the exotic tastes of cinnamon and clove, followed by hints of warm spice and vanilla. I can confidently say that it's now my favorite rum, by far. One of the cocktails we received was Captain Morgan Black on the Rocks (Black Spiced Rum over ice) and, though strong, I immediately warmed to the taste of vanilla and appreciated the smooth finish. Toby recommends that if you drink this on the rocks, you let it sit before sipping. The next cocktail, the Henry Morgan's Old Fashioned, was crafted from Captain Morgan Black Spiced Rum, Bitters, Raw Sugar and included an Orange Twist. I was surprised by how much I enjoyed this cocktail, as I normally wouldn't have indulged in anything that had bitters as an ingredient. But, this cocktail was bold and pleasurable. Place the orange peel, sugar and a few drops of water in a sturdy rocks glass and muddle with the back of a spoon. Stir the remaining ingredients in a cocktail glass with ice and strain into the rocks glass over fresh ice. Thanks to Ciro's, we were also treated to some of their dishes. First up was their Black Truffle Popcorn. Lightly salted and popped to perfection, the popcorn is delicious with the black truffle oil. This is a must-try. Almost immediately after, we were then presented with Ciro's Jumbo Grilled Asparagus, wrapped with prosciutto, and with lemon gremolata and parmesan tuille. The asparagus spears were grilled perfectly and the drizzled sauce was a highlight. Next, a Captain Morgan Black & Honey cocktail was served to us all, followed by Prime Beef Tartare. Combine liquid ingredients in a cocktail shaker with ice and shake until cold. Strain into a rocks glass and garnish with a lemon wedge. This cocktail was my favorite of the night. It reminded me a little of a Long Island Iced Tea, but more sophisticated and the taste was so much better thanks to the vanilla in the Black Spiced Rum. The Prime Beef Tartare was tasty. I didn't know "tartare" meant rare until I googled the next day (I know! Shame on me...) so I ate it, but since I normally won't eat beef unless it's well-done (often times I tell the waiter/chef to just make it "burnt"), and I knew this wasn't, I couldn't stomach a second one. However, I do recommend for those who aren't as picky with their beef to try this! After the Tartare, we were served with my favorite dish of the night- the Chicken & Waffles! A delightful fried chicken piece sandwiched between two pieces of buttermilk Belgium waffle and topped with chipotle maple gravy, the Chicken & Waffles would have carried me on aroma alone. The waffle was crispy and the chipotle maple gravy was genius. I have never tasted anything like it before and next time I visit Ciro's I will have to request an extra side of it. We were then served the Jumbo Lump Crab Cakes, grilled atop fruit relish and drizzled with key lime mustard. Being born and living my entire life in Florida, I've indulged in quite a few crab cakes at various restaurants around the state. None of them compare to Ciro's crab cakes. Crispy on the outside and delicate on the inside, the crab cake paired with the key lime mustard is simply out of this world. Pair with the grilled fruit relish and you have a fantastic bite! As our last cocktail of the night, we had the Perfectly Black. Combine liquid ingredients in a mixing glass with ice and stir to perfection. Strain into a cocktail glass and garnish with a lemon twist. The Perfectly Black was fantastic as well. I'm looking forward to making these drinks myself! Our last Ciro's dish of the night was the dessert: Grilled Pound Cake. The Grilled Pound Cake isn't on the menu; the chef just thought it up and made it for us that evening, but perhaps it can be requested. The cake had that grilled taste to it while still having the traditional fluffy pound cake quality that everyone loves. The berries were marinated and juicy and everything was sprinkled with powdered sugar. It was a perfect ending. Lastly, we all had the opportunity to speak with Toby Maloney himself! About Toby Maloney: He is the Chief Creative Office for Alchemy Consulting and is a self-proclaimed 'Intoxicologist'. He attended culinary school in San Francisco and has traveled the world. Toby has crafted award-winning cocktails for several venues, including The Violet Hour (his own bar in Chicago), which was named GQ magazine's "Top 25 Bars in America", and was deemed the "Ground Zero for cocktail culture" by Details magazine. The Violet Hour has earned a semi-finalist nomination for the James Beard Outstanding Bar Program 2012 award. While mixing the cocktails, he told stories, made witty jokes, and highlighted the history of some drinks. Full of interesting information, it was an absolute pleasure to be a part of his "audience"!